FESTIVALS. PRIVATE PARTIES. SPECIAL EVENTS. ​Now booking for events in 2019! 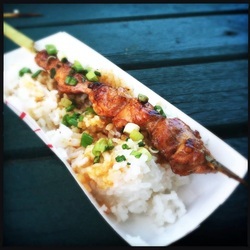 All skewered items served on a bed of sticky rice with fresh green onions and soy sauce. ** Skewered items are GLUTEN FREE!